Its absurd that anyone is awake at six o'clock in the morning, especially a musician. I'm better playing into the night than I am getting up with the birds but times change and I can do this. Coffee helps, it always has. I will need it soon but first I want to tell you about the most unlikely of friends anyone could ever have. I grew up in a small family, Lee Gibson grew up in a large one. As a child, I imagined a world full of adventure. Lee was born a pirate. I struggled with all things athletic. Lee was a boxer. I was shy around girls. Lee by his own figuring was Casanova. I went around the world with Rick Hansen because we were friends. Lee went around the world with him because they were blood. For a very long time Lee and I looked at each other, wondering why fate put us together but as we pushed thousands and thousands of miles helping Rick realize a dream bigger than all of us, I came to think about Lee as my friend, as my protector and as a man with a deep conviction for following the beat of his own drum. 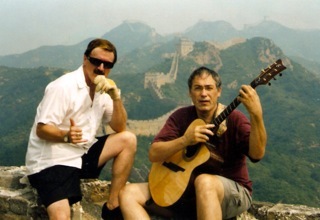 Lee was not always easy to be around during our time together on the Man in Motion Tour. He was often in trouble for chasing big ideas, complicating the simplest of tasks and always defying authority. But he would never knowingly hurt anyone. Once in Japan he talked his way into the kitchen at McDonalds and started flipping burgers, convincing the staff he was somehow a legendary chef. In Holland, he stole and cooked a goose from a Zoo for Thanksgiving dinner and on more than one occasion, he would disappear with a girl he met along the road, who he claimed, needed his help. Officially, Lee was the cook for our journey around the world. That part was always true. It was a responsibility he was dedicated to, until something else caught his attention. Unofficially, Lee's humour and loyalty was often the glue that kept us pushing so hard. I worried about him sometimes...I think he worried about all of us too- but in the show that surrounded Lee, it was not easy to hear him say it. Lee loved fishing. He loved his family. He could have been one of those flamboyant chefs with with his own reality TV show but instead he went on a great adventure with us. I was once but I'm no longer confused about my feelings for Lee. I loved him like a brother. I only wish I had the chance to tell that him before he died recently. But somehow he knew. He always knew, maybe that's just the way it is with big brothers.